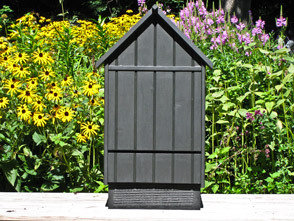 best bat houses IN THE NEWS! YEs, you do want bats, "and they're really cute!" Integrated pest management is an integral part of organic production and that includes natural controls for insects. If you want to control mosquitoes, you want bats. 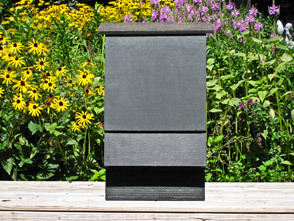 “One little brown bat can eat up to a thousand mosquito-sized insects in one hour,” says Mary Dussling, “besides, they’re really cute!” Dussling designs, builds and markets Best Bat Houses. 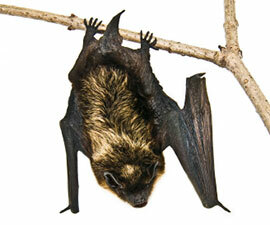 The houses are certified by Bat Conservation International and specifically designed for the upper Midwest. Dussling says the size of the chambers and the color of a bat house vary by climate. 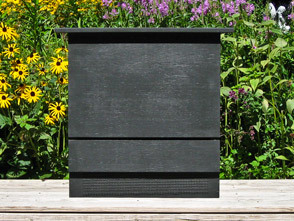 Houses should be black in Wisconsin, the further south you go, the lighter the color, “parts of Arizona, you want a white house.” Location of the bat house is another key factor. Like many, Dussling is concerned with the rapid decline in bat populations due in part to white nose syndrome; she helps support research into the disease.